...And The Great Pumpkin Will Rise Out of the Sincerest Pumpkin Patch! “Dear Great Pumpkin, I am looking forward to your arrival on Halloween night. Even though Charles Schulz, creator of the immortal Peanuts has changed his residency to the heaven-side, his kids: Charlie Brown, Lucy, Peppermint Patty, Sally and Linus still show up in our newspapers, which is a delight. What would Fall be like without Lucy holding the football for Charlie Brown, promising that this time she won’t yank it away at the last minute, leaving him flat on his back with all the air punched out of him. Or Linus sitting out in the pumpkin patch with Sally, Charlie Brown or Snoopy, convinced that if his pumpkin patch is the most sincere pumpkin patch, the Great Pumpkin will rise up with his bag of toys and bestow gifts upon him. His friends are scornful and skeptical. We would be, too. We have the sincerest pumpkin patch in Sierra Madre every year on our street. Talented neighbors grow astonishingly huge pumpkins then carve them into fantastical creations. These aren’t those thousand pound babies you see on TV that need a forklift to move, but they’re pretty close. In just a few days when Halloween rolls around we might see Cinderella’s coach, the body and head of a black widow spider...yes, they add twenty foot long legs, a lamp for a skeleton to read by, and just plain scary jack-o-lanterns. In days of yore, when our kids, and probably your kids, too, were young, they’d rummage through the house and create costumes for themselves, one of the best being our son when he was about twelve, dressed in one of my old maternity dresses – well, the baby was only six by then and, who knew, I might have needed it again - a cascade wig of curls, all the makeup in the world and a pillow stuffed up inside to create the baby on the way. He wore heels, too, and staggered off returning minutes later to change into tenneys. They were hobos, clowns, hippies and sometimes, just, “I’m not sure, mom said it was the fifties!” They’d hit the streets of our neighborhood where everybody knew them and gave them cookies, pennies, apple cider, a few Hershey’s kisses and the occasional Snickers bar. A massively good time was had by all, they came home covered with sweat and chocolate, sat down, compared the take, did a lot of trading, and ate all they wanted that night. Every year I assured them that I’d put it in the freezer and they could have a couple of pieces every day. They forgot about it almost immediately and after John and I picked out all the good stuff, we threw the rest away. It was fun, they were safe and it was no big deal. Now we love seeing the littlest kids, out with their mommy and a brother or sister in a stroller early in the evening. They are adorable, say thank you with just a little prompting...or a lot of prompting...and are happy with a Tootsie Roll. Later we turn out the porch light and see what’s left. Tootsie Rolls, by the way, go really well with a nice glass of Chardonnay. My favorite is Dots. Little boxes of Dots. I have a hard time letting go of them and end up hoarding a whole bunch of these little boxes. I have no idea what Dots are made of, but when one comes across a leftover box of them sometime in March, they are just as sticky good. When the world ends, cockroaches, Twinkies and Dots will survive. Halloween is just a few days away. Have you got your costume yet? 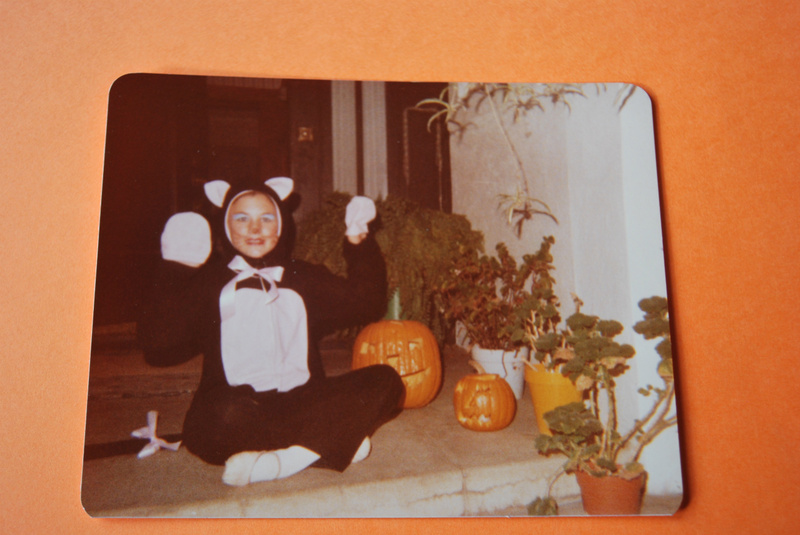 Speaking of costumes, the cat suit here on baby Crissy was made by my own careworn hands. I’ve created butterflies...it rained that year and Patti wore her butterfly, complete with wings and a sweater worn backwards. Remember The Adams Family? We made Thing out of a big box and a really nifty white glove hat, fingers stuffed with cotton. It was a hit. Happy Halloween, friends and family! Hope you get lots of Milky Ways...and Dots!